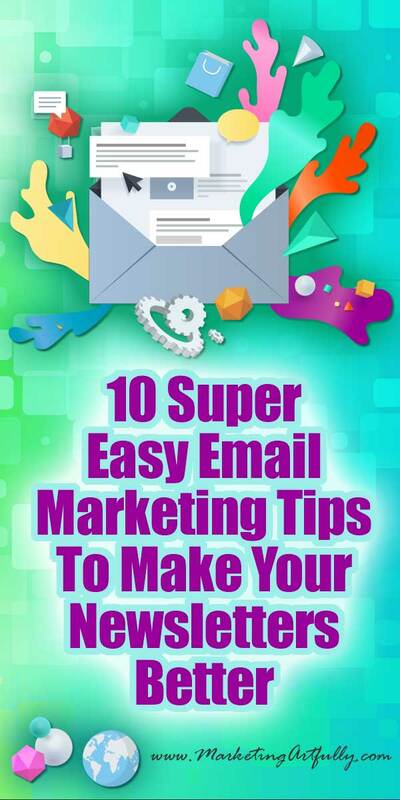 These 10 easy email marketing tips (plus a bonus!) are for my friends who are messing up their email efforts something fierce… easy, practical & can make a HUGE difference to your business! I was talking with two super nice guys who have a software company the other day and somehow talk got around to their email newsletters… oh yeah, that’s right, I asked if they sent them out because I didn’t remember reading any. And come to find out they were sending me two messages a week but they were so absolutely “blah” sounding that I never opened them! Now, it is easy for us to mock, but remember a time when I wasn’t so gung ho about my email list. I kind of felt like they never really responded, some of them marked me as spam and they were unsubscribing as fast as they were coming on to my list. But today I LOVE my list, people are constantly talking to me, adding themselves to sub lists and generally milling around, having fun, taking my recommendations and buying things from me! Whoo whoo! I used to have HUGE email newsletters thinking that the more I put in there, the more chances that I had someone would do something. Over the years I figured out that this doesn’t really work. More and more people are reading their email on their phones or tablets so all those sidebars and extra fancy bits were just messing me up. Also, I heard back that people LOVED to put my newsletters in a “special” folder that they would read when they had the time… oh is that special folder a kiss of death! Now I make sure that my email newsletters are short, to the point and have links to additional longer things if they want to click them. Most times my newsletters are a sentence or two about the topic and then a link to the blog post I wrote that week. My first goal is to get them to click through to my site and read my post. My second goal is always to have something to sell them in the “PS line”. This is Postscript after I have signed my name to my email. This gets seen more than any other part of your email because almost everyone scrolls to the bottom to see how long it is or if there is something cool down there. Humans are weird… use it to your advantage. I sometimes send them to one of my resources that compliment the newsletter content, sometimes a free video that leads to an affiliate offer or sometimes to a book recommendation on Amazon. I state plainly that it is an ad by putting (#ad) beside it! One thing that helps your email deliverability is if people DO something after they get your message. One thing they can do is open it. This is your “open rate”. Mine hovers between 22-30%. Some people have better rates and some have worse. But another thing that helps your emails stay out of the spam folders is if your subscriber responds back to you (hits the reply button). This is a huge signal to the email providers that you might be important to the reader and they should make sure your messages get delivered. As you can see, no promises, no big deal, but people love to email me back their store. Often times I can give them quick suggestions and help them right away, which makes them like me even more and they stay on my list longer… such an awesome spiral of wonderfulness! Sometimes for no reason your email will go to Gmail’s spam folder but no one knows why… you have to offer your subscribers instructions to tell Gmail, or any mailbox that you don’t belong there! And this always seemed really hard to do!! But Chris has a super simple way to tell your peeps how to do it… Email Whitelist! Check it out! Even if you aren’t ready to do the whole “upload a page to your site”, the practices that Chris shares are so super valuable and once you have them in your email sequences you are set for life! I have a super simple system for sending out my emails. Any “broadcast” or whole list email that I send goes on Friday. So if I am emailing everyone with a post like this, they all get it on Friday. If I am sending out to all the Etsy peeps, that goes on Friday. Friday is my big email day! My autoresponder or onesy twosey emails go out on certain days depending on their industry. When they sign up for my list they get to pick Etsy, Real Estate, Writer or Entrepreneur (if they don’t pick they go into entrepreneur). The nice thing about this is that if they are picked more than one industry they will never get more than one email from me per day! So the reason that my friends’ emails were so boring subject line wise was that they were using a plugin that took their blog posts and just sent them to their email list. Their emails were not anything but a (semi bad / boring) subject line and then the first few sentences of their blog posts. I KNOW, the 4 Hour Work Week says to automate everything. It is so much easier to have to have a plug in automatically do that then to take a couple of minutes and write something personal to your list. But they have between 32-50 THOUSAND email subscribers. Holy schnikeys! How could it not be worth their time to spend 15 minutes a week if they could get more results from their list. You are busy, right? Me too! You get lots of emails, right? Me too! And while there are some marketing emails I always open… hmmm… thinking about it there are very few, generally I check the subject line of the message to see if I think it will apply to me! [NEW] 33 Gorgeously Executed Fonts (Handwritten And Script!) – Fonts are my JAM and I got 33 for $10 SCORE! And that is about it. I get over 1,000 emails a day and almost all of them will be ignored. While you might not get as many as I do, do you get a lot? Do you ignore almost all of them UNLESS they seem like they will apply to you and your life? As humans we have to do this or we will be overwhelmed with noise! Your email subject lines HAVE to be something great that will serve as a call to action to get your message opened! It is easy to forget when you are sending out emails that only ONE person is going to be reading them. I always find it weird when I get a message that starts, “hey gang” or “you guys” when I am just sitting here by myself. I hear that old joke, “what do you have a mouse in your pocket?” which makes me giggle but just makes my dogs wake up and look at me! You should be writing your emails to one person only, as that is who is going to be reading it! Your emails may need to be more formal than that, but you could think of a business contact or client instead. Don’t try to come up with EVEN MORE content if you are doing a blog, podcast or making videos. Doing your newsletter should not be high pressure. Take something that you have already done, add a wee bit of behind the scenes to it and then send it out there! It will help your views or downloads, you won’t have as much pressure on you. If you don’t make content then collect other great things you find and talk about that. One of my favorite newsletter for years is a guy who collects (curates) cool design articles and sends them out once a month in his newsletter. I think some are his but most he is just telling me about! This one is HUGE! If you have not emailed your list for 2 years, scrap it and start over. BUT if you have it in your head that you are supposed to email them every week and you have have missed a couple of months, believe me, they didn’t notice! Do NOT do the big announcement that you are starting up your email list again. Just send out SOMETHING amazing and get right back on that horse! There have been times I haven’t emailed segments of my lists for months and I get emails back about how much they enjoy my “weekly” emails. It will always seem to them that you send out more than you actually do! Bonus Resource: How Often Should You Send Your Newsletter? BONUS STOP THE SPAM TIP! This is my bonus that has helped me stay way under my “marked as spam” limit for YEARS! It is the most brilliant way to keep people from just hitting that old spam button! I am not sure why so many people are “spam happy” but doing this at least makes them think about whether they are going to hate me forever. The thought of NEVER being able to be added back (which is true) is enough for them to simply unsubscribe rather than mark it as spam! There you have it! 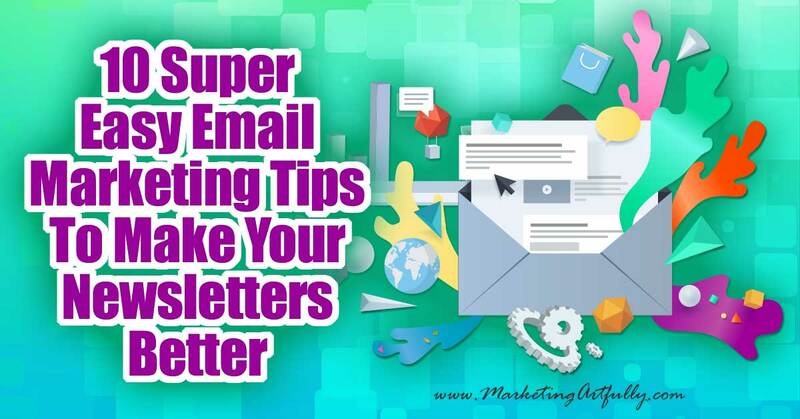 All my best easy email marketing tips in one tidy little list. I KNOW some of them you are doing great at and some seem really hard to manage, but believe me, the more you make your list happy, the more they will want to hear from you! If I hear one more marketing guru say, “the money is in the list” I will SCREAM. The people who know, like and trust you are on your list and they are worth taking a little time to acknowledge and care about!